Wedding day advice from our preferred Skin Care Specialist. Call today to talk to Jill. Aesthetician & skin care specialist. Stress, weather, and other external forces will often dictate what our skin looks like but there are many things can be done leading up to your big day in terms of a skincare ritual that can help alleviate this from happening. I'll address the most common questions about wedding day skin care tips below. 1. How long before a bride's wedding should she start a skin care regimen to improve tone and texture of her skin? A consistent treatment and product regimen should be between 2-4 months prior to the wedding. For more mature skin, where there can be more concerns with uneven color, laxity, lines and wrinkles; 4 months is crucial. Acne problems can be stubborn and controlling, so it can take more time to get it under control- start earlier for better results. For someone with little concern, but looking to get a fabulous glow and texture improvement to the skin; 2 months can be enough. All the while for all people, using an AM and PM skincare routine to maximize and maintain is important to ensure the BEST results for the big day! 2. What is the difference between a facial and a peel? What type of results can you expect to see from each? A facial is deep cleansing, mildly exfoliating, and hydrating. A chemical peel is regenerating, smoothing, pore minimizing, tone evening and can be antibacterial depending on which used. The two compliment each other so much, the best results can really be seen when done together. 3. For brides that are looking to reduce the appearance of acne scars, what treatment would you recommend? It can really depend on the skin color and skin type for this one. More olive skin types can get brown discoloration on spots of acne, which would then be treated best with IPL (Intense Pulsed Light) and/or a medium-depth chemical peel. For lighter skin types with red/pink scars, Derma-pen treatments would be the best. For "ice pick" or any scar that causes an indentation in the skin, Derma-pen would also be ideal. 4. For us "oily-skinned" gals, what products and treatments do you recommend to help reduce oiliness? The best products to help exfoliate to maintain the results of the peels and flush out and shrink pores are professional strength Retinol, Alpha Hydroxy acids and the amazing Clarisonic Cleansing Brush with deep pore or acne brush head. 5. For the night before wedding prep; what can a bride do to ensure a radiant flawless glow? The night before, exercise if possible to stimulate circulation, a hot bath with a mask suited for their specific skin type, drinking TONS of water to flush toxins and hydrate the skin from the inside out and of course plenty of sleep. Using a satin or silk pillowcase will prevent "sleep lines". All this along with topically applying a professional Retinol cream or Alpha Hydroxy cream along with an individually suited luxurious eye and lip cream will have the skin canvas perfect for a WarPaint International Makeup Artist to work their magic for impeccable skin! 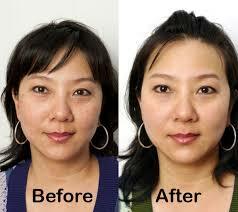 Below are some examples of skin care procedure before and afters. Click them to expand and have a closer look at the results. I offer the "Perfect Derma Peel", which is a bride and mother-of-the-bride favorite. What ingredients are in Perfect Derma Peel? Glutathione - an anti-aging ingredient and skin lightener. - The percentages are not noted as this is a proprietary blend, however this is proven to help with Melasma, Rosacea, Hyper-pigmentation, acne and some other skin problems. Is it safe for all Fitzpatrick's (Skin type scale - 1-6, 1 = super pale white to 6 = dark black)? Yes, the "Perfect Derma Peel" is safe for all skin types. Six hours. Overnight if there is no discomfort for you. How long does the Perfect Derma Peel last? Results with maintenance can last a long time. It can be done 3 - 4 times per year (4 - 6 weeks apart) and with the Perfect A it will elongate the effects. How long this procedure lasts depends on how well you care for your skin (i.e. staying out of the sun, tanning, etc). What does a kit cost and what does it include? Its $300 for a kit. It includes six customer take home kits with six peels in a kit and A moisturizer and Retin-A pads.